When the 1910 calendar page turned to March, prospects seemed bright for Alan Storke – in both his professional endeavors. On the baseball front, the young infielder had already placed four major-league seasons on his résumé, mostly with the Pittsburgh Pirates. Recently acquired by the Cincinnati Reds, Storke was penciled in as the club’s third baseman for the coming campaign. As was customary, however, Storke’s arrival in Cincinnati would be delayed by fulfillment of his other career’s responsibilities. Already a graduate of prestigious Amherst College, Storke spent the baseball offseasons completing course work at Harvard Law School and was on track to receive his degree in June. At the time, the only question about his future was how long the gifted Storke would continue to play ball before beginning his legal practice. Sadly, events soon rendered the question moot. Storke was stricken by grippe, which soon developed into a pulmonary infection. The condition did not respond to treatment, including emergency surgery, and in less than a fortnight, the bright promise of Alan Storke’s life had been extinguished. He was dead at the age of 25. The ill-fated Alan Marshall Storke was born in Auburn, New York, on September 27, 1884, the second of five sons born to prosperous lawyer Frederic Elliot Storke (1855-1926) and his wife, the former Kathleen Schuyler Davie (1859-1948).1 The Storke family was of English descent and long prominent in the community, a small city located in the Finger Lakes region of upstate New York about 35 miles west of Syracuse. Grandfather Elliot Grey Storke (1811-1879) had been a civic leader and publisher of the local newspaper. Alan’s father was a name partner in a city law firm, a director of various businesses, and a longtime member of the Auburn Board of Education. 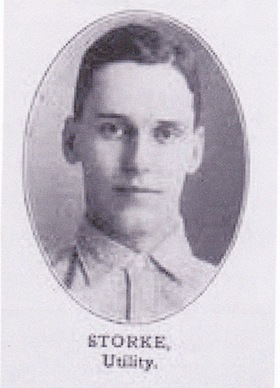 Fred Storke had also been an outstanding baseball player, a star catcher/second baseman while in college at Amherst. Thereafter, he played briefly as a professional for an early Auburn club.2 Thus, Alan and his brothers grew up with all the benefits of financial means, social status, and local celebrity. As a boy in his hometown, Alan began “play[ing] ball in the back lots when he was knee-high to a grasshopper.”3 At Auburn Academic High School, he followed in his father’s footsteps, excelling both in the classroom and on the athletic field. Regarding academics, Storke showed a particular aptitude for higher mathematics, and was valedictorian of the Class of 1901. He was also a letterman in football, the star of the AAHS baseball team, and an actor in school plays. Above all, Storke was respected and well-liked by his teachers and classmates, with the term “gentleman” often used to describe him.4 After his high-school graduation, Alan worked for a year before matriculating to his father’s alma mater, Amherst College in Amherst, Massachusetts. There, his high-school experience repeated itself, with Storke distinguishing himself in both academics and athletics. On the gridiron, he joined his older brother, Paul, in the backfield of a Lord Jeffs eleven that defeated Harvard, 5-0, in October 1903, the first Amherst victory in 25 games against the Crimson.5 But Alan’s forte remained baseball. In his first two varsity seasons, Storke alternated between catching and pitching, his mound exploits including a 2-1, 11-inning victory over Colby College and future major-league standout Jack Coombs. Thereafter, he switched to the infield, playing mostly third base. Notwithstanding the time demands of his football/baseball commitments, Alan did not neglect his studies and graduated on time with his bachelor of arts degree in June 1906. Upon graduation, Storke returned to Auburn and entered the ranks of professional baseball, signing with a short-lived local entry in the Class D Empire State League. He was batting .350 when the Auburn club disbanded in July.6 Storke then jumped up to Class A baseball, becoming a member of the Providence Grays of the fast-paced Eastern League. In 57 games primarily at third base, he hit .290, and was drafted by both the American League Philadelphia A’s and the National League Pittsburgh Pirates.7 Awarded to Pittsburgh by the National Commission,8 Storke was a late-season call-up by the third-place (93-60) Pirates. He made his major-league debut on September 24, going 1-for-4 against Vive Lindaman of the Boston Braves. Before the season ended, he appeared in five games, batting .250 (3-for-12, with one RBI) while handling 11 of 12 infield chances successfully. He had bridged the divide between college ball and the major leagues in a single year, and big things were expected in future from Storke. In 1907 Storke impressed early, with Pirates club owner Barney Dreyfuss pronouncing him “the find of the season” as spring training camp broke.9 For one thing, Storke, a well-built 6-feet-1 and about 180 pounds,10 looked like a ballplayer. He batted and threw right-handed, and had good hands and a strong throwing arm. And he was versatile defensively, able to fill in anywhere in the infield. Storke’s most noticeable shortcoming was a lack of foot speed, a surprising deficiency in someone who only recently had been a college halfback.11 With Pirates star Tommy Leach clamoring to return to the outfield, Storke was tried at third base early in the season but proved a disappointment, so much so that Pittsburgh placed him on waivers – only to recall him when Brooklyn expressed interest in Storke.12 He fared worse as a temporary replacement for injured second baseman Eddie Abbaticchio, a late-inning Storke error costing Pittsburgh a game against the Phillies. But Storke seemed to find himself when assigned to first later in the season, hitting well and fielding the position capably, prompting Sporting Life to proclaim that “Storke is putting up a dandy game at the Pirates first station and is hitting splendidly. They say it will be almost a miracle if injured Jim Nealon gets his job back.”13 By season’s end, Storke had seen action in 112 games, batting a Deadball Era-respectable .258, with 39 RBIs. His fielding ranged from excellent at first (.990 FA in 23 games), to adequate at third (.925 in 67 games), to dismal during brief tours at second and shortstop (.820 in 12 games, combined). With youth and a decent bat to commend him, Storke figured to be an important cog in Pittsburgh plans for the coming years. Storke, meanwhile, was making his own future plans – which did not include an indefinite stay in baseball. Rather, he intended to take up his father’s profession. To that end, Storke enrolled in Harvard Law School, which he would attend in the offseason. With the approval of club owner Dreyfuss, Storke would remain at school until the end of the spring semester in June. As the Pirates headed for 1908 training camp, “Alan says that he finds it hard grinding at his law studies and would greatly prefer being down south with the boys working out but – he says – duty is duty and he will stick to his books.”14 In off-school hours, however, Storke attempted to stay in shape by working out with the Amherst varsity.15 Storke reported to the Pirates on June 11,16 and thereafter saw action in 64 games, mostly at first base. At season’s end, Storke’s performance drew a mixed review from Pittsburgh sportswriter A.R. Cratty: “Storke’s play at first base wasn’t first class because he is too slow on his feet. However, its bingles that the management wanted and the Amherst man is better at this line than anyone else tried at the initial sack.”17 For a second-place (98-56) Pittsburgh team that, despite having league-leader Honus Wagner (.354) in the lineup, posted a collective .247 batting average, Storke hit .252, with 12 RBIs (compared with the .216 BA, with 13 RBIs, registered by alternate first baseman Harry Swacina). In 1909 Storke’s attendance at Harvard precipitated the first of the two mild controversies that attended his major-league career. As with the previous season, Storke was not expected to report to Pittsburgh until early June. But on May 12, he was hastily summoned to Philadelphia to fill in for ailing Pirates first baseman Bill Abstein. Storke’s presence in the lineup was quickly brought to the attention of National League President John Heydler. Heydler deemed Storke’s absence from the Pirates’ Opening Day roster as placing him in breach of contract, and ruled Storke ineligible to play until formal reinstatement was granted Storke by the National Commission, Organized Baseball’s governing body. Heydler’s decree infuriated Barney Dreyfuss, who emphasized that Storke was not in breach of contract. Storke had been given express permission by the Pirates to remain at school until June, and his appearance against the Phillies had been an emergency measure. At this, Heydler backed down, authorizing Storke to play until the National Commission had rendered a determination on his eligibility. Within days the National Commission adopted the Dreyfuss position in the controversy, and reinstated Storke without penalty.18 By that time, however, a recovered Abstein was back in the Pirates lineup, while Storke had returned to class at Harvard. When he rejoined the Pirates in June, Storke divided his time between first base and third, batting .254 in 37 games for a Pittsburgh club headed for the 1909 National League pennant. In mid-August, Pirates manager Fred Clarke attempted to shore up the club at third base, trading Storke and infielder Jap Barbeau to St. Louis in exchange for slick-fielding Bobby Byrne. The trade generated controversy when it was discovered that Clarke had “promised Storke and Barbeau that the transfer would not interfere with their interest in the postseason money if Pittsburgh was lucky enough to land the National League pennant. The proceeds will merely be divided by one more player – the lucky Byrne.”19 When the time came, the three received $1,235.33 each, much to the chagrin of the National Commission, which subsequently promulgated a rule [Rule 19] forbidding in future disbursement of pennant-winning prize money to any player not on the club’s season-ending roster.20 In the meantime, St. Louis manager Roger Bresnahan had installed Storke at shortstop, where he played competently (.958 FA in 44 games), his reputed slow feet notwithstanding. Storke also hit well, raising his average to a career-best .282 in limited play for the Cardinals. Sources for this bio include the Alan Storke file at the Giamatti Research Center, National Baseball Hall of Fame and Museum, Cooperstown, New York; Retroseheet; Storke family tree information accessed via Ancestry.com; the Amherst Olio yearbook; and the newspaper articles cited below, particularly items about Storke published posthumously in the Auburn (New York) Citizen. 1 The other Storke brothers were Paul (1883-1905), Harold (1890-1961), Frederic (1892-1973), and Arthur (1894-1949). 2 After graduating from Amherst College in 1876, Fred Storke played second base in the first professional game ever played in Auburn, a 12-6 win by the locals over a team from Poughkeepsie on July 8, 1876. Not long after, Storke was released by the Auburn club and began reading law. He was admitted to the New York Bar in 1879, and later became a partner in the firm of Underwood, Storke, and Seward, Esqs. Even while practicing law, Fred Storke played amateur baseball into the 1890s, as per the Auburn Citizen, February 15, 1907, and the Frederic Elliot Storke posting on the Find a Grave website. 3 According to Storke himself in Sporting Life, June 26, 1909. 4 See e.g., the testimonials published in the Auburn Citizen, March 26, 1910. 5 As reported proudly in the Auburn (New York) Bulletin, October 12, 1903. 6 As per Sporting Life, August 11, 1906. 7 Sporting Life, September 8, 1906. 8 As per Sporting Life, September 15, 1906. 9 As reported in the Daily (Springfield) Illinois State Journal, April 22, 1907, the Washington Post, April 29, 1907, and elsewhere. 10 Neither baseball reference works nor the reportage reviewed by the writer provided a specific weight for Storke. The 180 pounds assigned to him herein is a guesstimate based on photographs of Storke. 11 Pittsburgh sportswriter A.R. Cratty later observed in Sporting Life, April 10, 1909, that “the former Amherst man isn’t quick-footed by any means. Slow from the knees down is the saying.” A nonbylined Cincinnati scribe concurred, stating that Storke’s “slowness on the bases alone has prevented him from becoming a regular infielder.” Cincinnati Post, February 23, 1910. 12 As per Sporting Life, May 25, 1907. 13 Sporting Life, September 7, 1907. 14 Jersey Journal (Jersey City), March 5, 1908. 15 As per Sporting Life and the Washington Post, February 8, 1908. Also on the Amherst campus was younger brother Harold Storke, a catcher for his class team. 16 Pittsburgh Press, June 11, 1908. 17 Sporting Life, November 3, 1908. The Cratty view of Storke’s defensive play at first, however, was not unanimous. In the estimation of Jacob C. Morse, “Storke, the Harvard Law School student, did very well indeed when played at first base.” Baseball Magazine, November 1908. 18 For more on the National Commission decision, see “The Storke Case” in Sporting Life, May 29, 1909. See also, the Fitchburg (Massachusetts) Daily Sentinel, May 23, 1909, Grand Rapids (Michigan) Press, May 25, 1909, and Rockford (Illinois) Daily Register Gazette, May 29, 1909. 19 San Diego Union, August 29, 1909. 20 As per Sporting Life, November 6, 1909, and April 30, 1910. 21 As reported in the Daily Illinois State Journal, January 23, 1910, Elyria (Ohio) Evening Telegram, January 25, 1910, and elsewhere. 22 Cincinnati Post, February 8, 1910. Griffith’s confidence in Storke’s remaining in the game appears unclouded by knowledge that Storke’s father was senior partner in a thriving law practice back in Auburn. 23 As per the Cincinnati Post, February 10, 1910. 24 Cincinnati Post, February 23, 1910. 25 The death certificate for Storke listed the cause of death as general streptococcus infection (11 days duration), with empyema (two days) given as a contributing factor. 26 As per The Sporting News, March 24, 1910. 27 Auburn Citizen, March 27, 1910.